What happens when you’re transporting a potential zombie cure to civilization and then discover the cure might be something slightly different than you expected? And, as you try to figure that out, you’ve got to keep it secret from an inquisitive former entertainment reporter you’ve rescued along the way? Eat Slay Love gives you a pretty good idea. 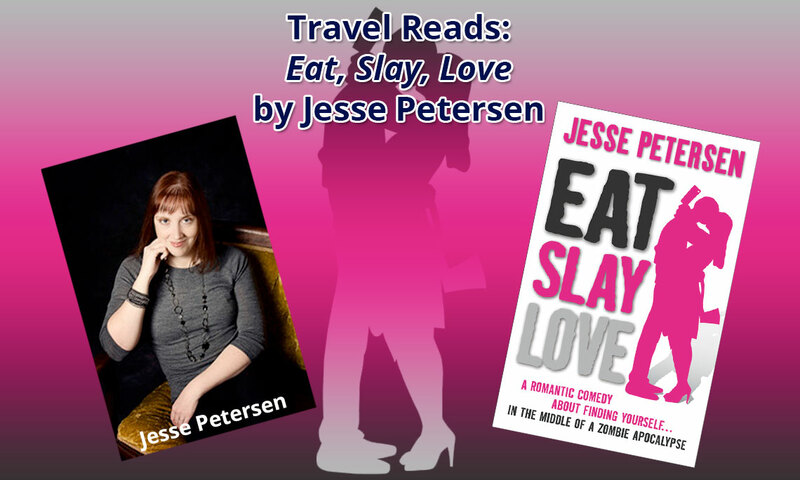 Eat Slay Love is the third book in Jesse Petersen’s Living with the Dead series about a married couple surviving the zombie apocalypse. In this installment, Sarah and David are transporting the zombie cure revealed in the second book (Flip This Zombie) to the Midwest Wall – the wall that separates the zombie-infested badlands from civilization. Along the way, they rescue Nicole Nessing, a former entertainment reporter with her eye on getting a Pulitzer, and Colin McCray, the still-somewhat-drug-addicted lead singer for the now dead (in more ways than one) British rock band Lead Tongue. They also face zombie attacks (what self-respecting zombie apocalypse novel would be without those), an anti-social cult who feed strangers to zombies, and eventually the government bent on covering up the zombie infection fiasco. Although you might have a stronger vested interest in Sarah and her husband David if you’ve read the first two books, Eat Slay Love was written in such a way that it could satisfactorily stand on its own. I must admit that this is one of the few sequels I’ve read out of sequence that did this so successfully. The other one that comes to mind is Anne Rice’s The Vampire Lestat, which I read before reading Interview with the Vampire. I truly enjoyed reading the snarky, flippant and relaxed style that Petersen used for this book. She is deft at squeezing out all the comic zaniness that is inherent in a zombie apocalypse. Petersen is also good at developing three-dimensional female characters. Since Sarah is the narrator of the story, you get a first-hand view of her personality. Also, the character of Nicole Nessing is revealed, layer-by-layer as the book progresses. Alas, as good as Petersen is at developing female characters, she seems to neglect her male characters. Both David and McCray seem to be there mainly to act as a foil for the female characters or for comic effect. Who is David? Why does Sarah love him so much? Maybe that is better revealed in the previous two books? Although I don’t normally go for the girly books, I have to admit I really enjoyed reading this one. Maybe because it also had a good dose of mystery, action, and thriller thrown in for good measure. This is a quintessential sitting-by-the-pool summer read: quick to read and highly entertaining, without bogging the mind down with too many deep thoughts (I like to save those for more thoughtful times of the year). If you’re looking for a book that will make you smile, has just a touch of zombie gore, and is written in an accessible, easy-to-read style that will have you flipping through the pages as quickly as you would run from brain-starved zombies, then Jesse Petersen’s Eat Slay Love is a good bet.